Are you looking for contemporary flowers to decorate your modern house? We have some ideas for you. We’ve put together a list of flowers that look stunning as part of a modern decorating scheme. All of these flowers do well indoors, which means you don’t necessarily need to get a lot of light in your house for them to thrive. But, if your house gets quite a bit of sun, these flowers will surely be okay too, and they’ll likely flourish. The following indoor modern flowers will do well in most rooms in your home. Anemone is a perennial that has beautiful basal leaves (a cluster of leaves that radiate from the base) and long-leaf stems. It’s a bloom that typically has from four to five petals fanned out to reveal a dark, inky center. 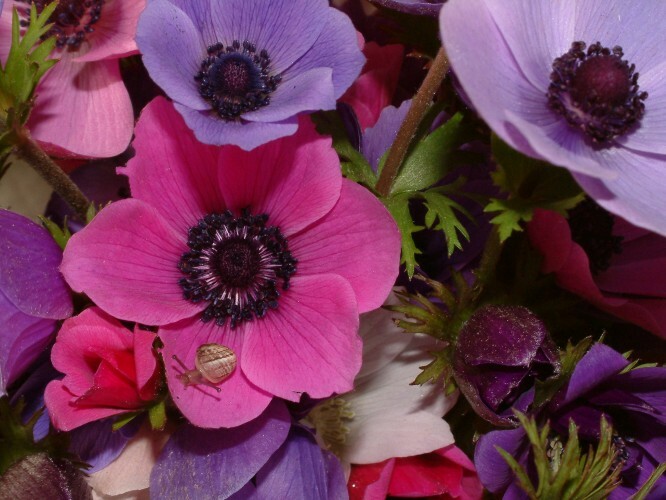 Anemone blooms come in many colors, from white and purple or orange and red. We especially love white anemone for a modern house. Technically, bromeliads are not flowers. But, they’re plants that look like flowers so we’ll include them in our list of modern flowers for a contemporary home. Bromeliads flourish in low light and they add flair to any indoor space. They’re natural beauties that can bring vibrancy and color into a kitchen, bathroom, living room, or dining room. Peace lilies are also low-light plants. They make great additions to a modern home with their gorgeous, white-cupped petals, which are moderately fragrant. Peace lilies are long lasting and need very little attention, which means you can place them in a space in your home and simply enjoy them. Another low-light flower, the zebra plant has striped foliage that looks incredible with many modern interior design plans. This flower is beautiful year round, but once a year you’ll especially adore your zebra plant as it produces pretty yellow flowers. The Christmas cactus is a popular Christmas plant for a modern home, but it’s not just to be displayed at Christmastime. This plant is a fantastic indoor plant for a contemporary house because it puts out little flowers, from white to pink to red, that look dramatic and magazine-photo worthy whether in a casual or formal room. Are there any modern-looking flowers that you especially love? We’d love to hear about them and share them with our readers. Feel free to leave us a comment below with the flowers you use to style your contemporary residence.